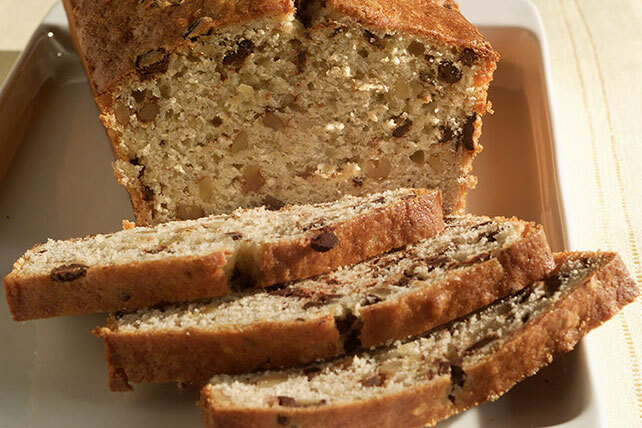 Team up chopped BAKER’S Chocolate with ripe bananas and walnuts and you end up with perfection – a moist banana bread that’s sure to win raves. Combine flour, sugar, baking powder and salt. Mix eggs, bananas, oil and milk in large bowl until blended. Add flour mixture; stir just until moistened. Stir in chocolate and nuts. Pour into greased and floured 9x5-inch loaf pan. Bake 55 min. or until toothpick inserted in center comes out clean. Cool bread in pan 10 min. ; remove to wire rack. Cool completely. Substitute 1 cup BAKER'S Semi-Sweet Chocolate Morsels for the chopped chocolate. For easier slicing, wrap bread and store overnight before slicing to serve.